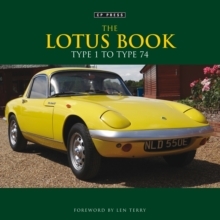 This is now established as the leading reference book on Lotus Cars 1948 to 1975. It combines superb period photography of the likes of Jim Clark and Graham Hill at Indianapolis with photography of the author. The author has included in this latest edition previously unseen photographs of both Jim Clark's personal Lotus Cortina and Jim Clark's personal Lotus Elan S3 that have not appeared in other books. Much has been written over the years about the marque Lotus and deservedly so, for there is little doubt that Colin Chapman was the outstanding automotive designer of his day. The wide range of Lotus cars covered in this book illustrates that claim perfectly, from the MK1 with 30 or so horsepower to some of the later models with something approaching 1,000 HP. It is believed that this is the first time they have all been covered in one volume. Includes a collection of important photographs from a variety of sources, plus F1 racing records and specifications for each model.